Who can possibly resist S'mores Candy Bark? Not me! Soft and sweet marshmallow, fabulous milk chocolate, crunchy and flavorful graham crackers, and surprising toffee bits make up this old time favorite with a brand new twist. You can even pop this S'mores candy in the microwave to enjoy that warm gooey texture that you remember so well. Flat rate shipping means the more you buy, the more you save! Simply choose the amount of chocolate bark candy you'd like to order from the drop down box provided above and click the Buy Now button. You'll be taken directly to Paypal to complete your order. 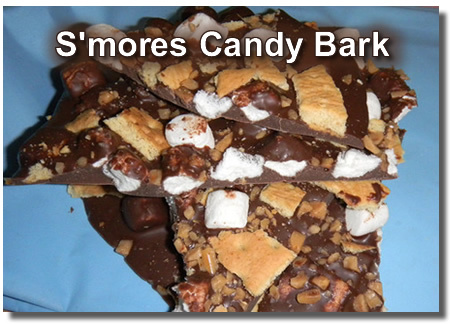 Shipping Costs: Your freshly made S'more bark candy will be shipped in an expedited USPS Priority Shipping flat-rate box to be sure you get it quickly. 8 ounces (1/2 pound) $7.49 (+ Priority postage $5.80) Use this special Buy Now Button to take advantage of this "taste testers" deal. Before You Decide! Did you know we offer 5 more different types of chocolate bark candy? Why not sample them all? 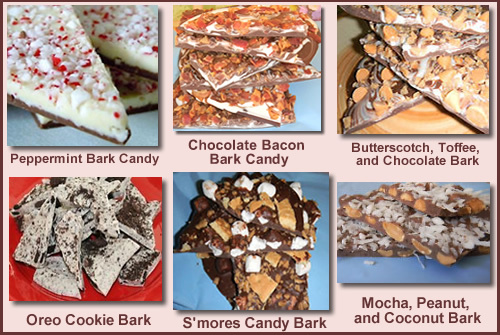 You can purchase any combination of our delicious bark candies (minimum 1/2 pound portions). Simply tell us exactly what combination you want when you place your order. Bark candy makes the perfect gift. No worries about size or color. One size fits all and anyone would be thrilled to get their hands and lips on our gourmet chocolate bark. For holidays, special occasions, or an everyday indulgence, you just can't go wrong with chocolate!